The heated indoor pool let's you get in a swim without braving the cold outside - bonus points for rad views. Monopoly and Old Maid are well and good - but billiards, foosball and ping pong take family game night to the next level. Went a little hard on the slopes? There's a hot tub for that. Grab a cup of complimentary coffee and curl up with that New York Times bestseller you're finally reading. The shuttle gets you to Steamboat Ski Resort in just 8 minutes, you'll be cruising down the mountain in no time. Two indoor hot tubs will soothe your muscles after a day shredding the slopes. Spring Creek Trail is just an 8 minute drive, get active while enjoying the views. Work on your long game at Rollingstone Ranch Golf Course, only an 8 minute drive away. 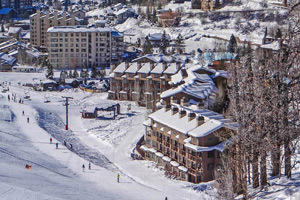 If your crew is looking for convenient access to Steamboat Ski Resort, but doesn’t fancy the hustle and bustle (or hefty price tag) of staying in the ski village then your search is over. The Legacy Hilltop Resort offers spacious, inviting condo suites and is just five minutes down the road from Gondola Square. You’ll feel right at home before you even get to the suite - with mountain views, cozy couches, a fireplace and free coffee you may be tempted to just park yourself in the Rocky Mountain style lobby. On day one of your ultimate family ski trip, fuel your crew for a day on the slopes with a hearty home-cooked breakfast thanks to a fully equipped en-suite kitchen (stock up at Safeway, just minutes down the road). Once everyone’s had their fill of your world-famous chocolate chip pancakes, get ready to hit the mountain. Hop on Hilltop’s complimentary shuttle and arrive at the slopes in minutes. Steamboat has been called one of the top ski resorts for families by both Parenting and SKI Magazines and is a fave for snowsport newbs and veteran shredders alike. With a world-class ski school, 165 trails, and a whopping 400 inches in annual snowfall - it’s not hard to see why! Tell the crew to meet up at the top of the Heavenly Daze lift at 1 pm sharp. That’s where former Olympic skier and local legend Billy Kidd holds his free daily clinic - just look for the man in the Stetson! Back at Hilltop, tell everyone to swap snowsuits for swimsuits and head downstairs. While the kiddos play Sharks ‘n Minnows in the indoor heated pool, soak away any knots in the jetted hot tub (follow-up stop by the sauna optional but encouraged). Studios and one- and two-bedroom suites at the Hilltop are clean and bright, with basic but tasteful decor and an earth-toned palette of tranquil taupes and beige. Hardwood floors and stainless steel appliances in the full kitchen make the units feel modern. Every rental also has a springwater bathtub for ultimate relaxation. Each suite has a living area with flat screen TV (bring along a few favorite DVDs for movie night with the crew) and queen size sleeper sofa. Free on site laundry facilities make sure you never run out of clean base layers, while complimentary ski lockers keep your gear safe and sound overnight. Take a break from the slopes with an afternoon in town! Historic downtown is home to more than just awesome shops, dining and art galleries. Surprise the little ones with bumper cars on ice at Howelsen Ice Arena, or shop for a souvenir at the century-old F.M. Light & Sons western wear shop. Looking to relax? Head to Old Town Hot Springs and take a relaxing soak in rejuvenating mineral water pumped from the historic Heart Spring while kiddos keep busy with waterslides and a climbing wall. - Front desk is open 7:00 AM-11:00 PM daily. Guests that are planning to arrive after hours must use the phone located in the lobby on the right from the front door to call security who will check them in. For more details please contact the property using information on the booking confirmation. The property will allow penalty-free cancellation up to 14 days prior to arrival dates within December 15, 2017 through April 1, 2018 based on the selected rate plan. All other’s may cancel without penalty within 3 days of arrival. If guests cancel outside this window they will be subject to a penalty equal to one-night + taxes. This does not apply to Non-Refundable rate plans.